Then check this pattern out HERE… my stunt double is out there somehwere! And the start of my Kiri shawl. Just this little bit of knitting took me nearly an hour! 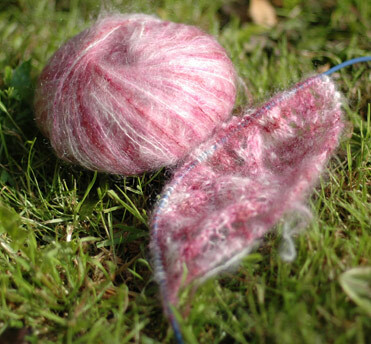 Today is looking to be a real beauty, if still a little nippy, so I think it’ll be back to knitting in the sun with some tea, with my coat on :} Haven’t done that in a while. 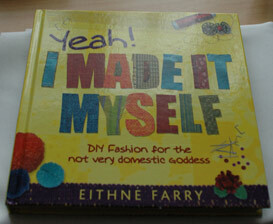 In other news, I want to tell you how impressed I am with my Yeah, I made it myself sewing book. Now, for all you John Rocca and Avoca seamstresses out there, this book is not going to win your Pulitzer. But for people like me, who started out trying to make PANTS and got discouraged when the crotch turned out like a cow’s udder – it is perfect. What I like most about it is, for the skirt patterns, there are none with extra waist bands that you have to sew on. I am really bad at doing that. Here, you just turn down a skinny hem and sew it carefully with the machine. 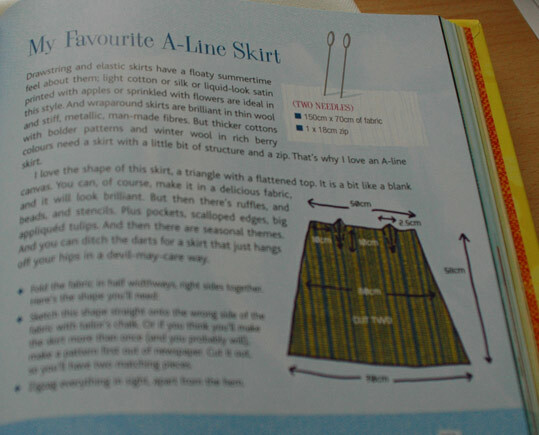 There are two skirts in this book that I want to make right away: the A-line skirt with darts and a zip (I think I posted a picture of the page at the weekend), and the pleated skirt. I got a Vogue pattern last summer for a skirt with pleats, and the instructions were so detailed and so complicated that I just kept putting off making it. This pattern, on the other hand, seems much more straight forward. If I make it out alive after the skirts, I would very much like to try a summer dress with very basic shaping (just some darts) and no sleeves. Looking for a fun summer pattern? 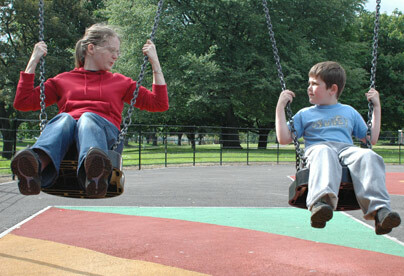 Have a look at this. I might be persuaded! Also, check out design*sponge for general design goodness. 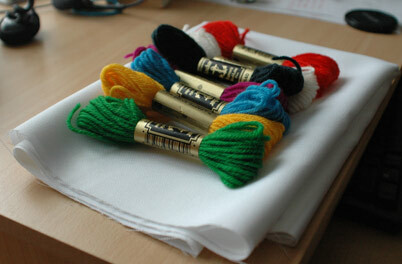 My last bit of news is that I got an email yesterday saying that my loom would be shipped today. Horray! The back piece of Salina has been zooming along very nicely. 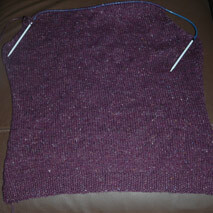 I took it along as commuter knitting today which helped alot too. I like the waist shaping in this very much. 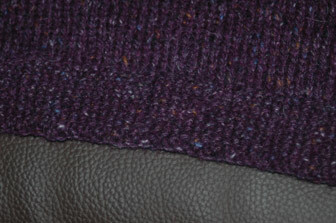 Another feature I like is the moss stitch at the bottom instead of ordinary rib or garter. And I got some other beads to make Alb a choker. This is pretty simple, but I hope he’ll like it. Since Salina is going so well, and it doesn’t require much concentration, I am thinking about starting a Kiri Shawl (link will open a PDF). This was my very first lace project rofl. I had to restart it about ten times, but I still managed to finish it in time to give to my mum last Christmas. 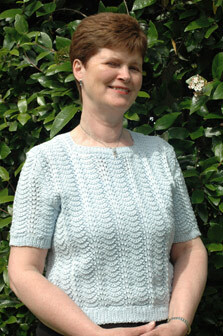 The pattern recommends Kidsilk Haze, but I recommend this! I picked it up in Yarn the last time I was there. It is so delicious looking that I put my face into it when I picked it up in the shop. The woman behind the counter was looking at me so I figured I’d better buy it – but I was going to buy it anyway I have already put my face into it three times this evening. I love this stuff even more because it is more than half the price of Kidsilk Haze. KSH is e10 for 25g. 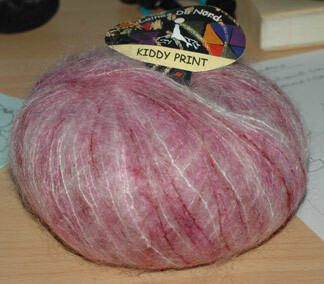 This Kiddy Print is e8 for 50g! 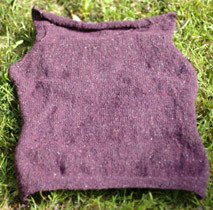 What I like the most about the Kiri pattern is that you can knit it for one, two or three balls of KSH. I figure that I will get a good sized shawl out of my 50g. I’m not really a shawl person, but I like scarves I can wrap up around me and tuck into any nooks and crannies that are letting in a draught. Vogue models, eat your heart out! 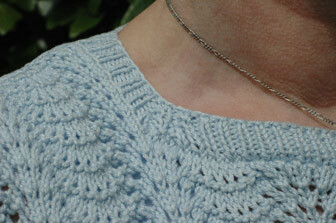 Here are more detailed shots of the set in sleeve and neck shaping. She’s really thrilled with how it turned out and I hope she will enjoy wearing it as much as I did making it. 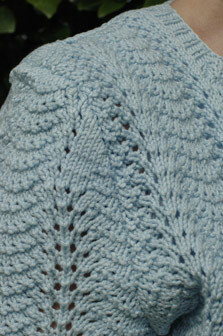 I am about half way through the back piece of Salina. It’s pretty boring st st but I love the fabric the felted tweed is producing. Dig the colours! I’m going to do some crazy flowers and insects. I was in town yesterday with my mum and she bought me this great book. It’s called, Yeah, I made it myself and it’s a sewing book for people who can’t sew very well, like me I figured it would be just a useless, cheesy book with no actual help in it, but I was quite surprised. Today, I had planned on getting started on some crewelwork, but things changed and I ended up going with my dad and my nephew to the playground. Horray!